Arditi GmbH is a subsidiary of the Italian Arditi Spa near Bergamo. The parent company was established more than 50 years ago. Since then, they design, manufacture and sell lightning components. The range is broadly diversified and includes switches, dimmers, sockets, bases, wires, transformers and accessory. In the meantime, Arditi has made a name in the sector of LED-technology. The company offers LED-modules in various forms, transformers and drivers, as well as LED-suppliers. Arditi has set many standarts with their products, thanks to constant research and development work. The high innovativeness of the company can be seen in their numerous patents. E27 socket with integrated Casambi wireless modul (TED) inside.To pimp up your luminaire just change the socket. 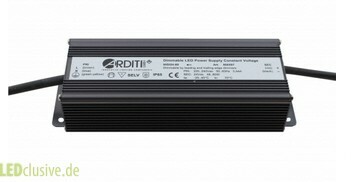 12VDC or 24VDC and 60W or 80W - dimmable DC power LED power supplies with IP65 for example LED strips for operation with a phasecut/edge dimmer.